A slightly smaller share of Hispanic students (57%) live in households with both of their parents, compared with non-Hispanic students (61%). Nearly equal shares of Hispanic (29%) and non-Hispanic (27%) students live in single-parent households. But, Hispanic students are more likely than non-Hispanic students to live in a household with someone other than a parent or grandparent (10% compared with 6%). Although there are not large differences between Hispanic and non-Hispanic public school students in terms of their living arrangements, differences exist among Hispanics of different generations. 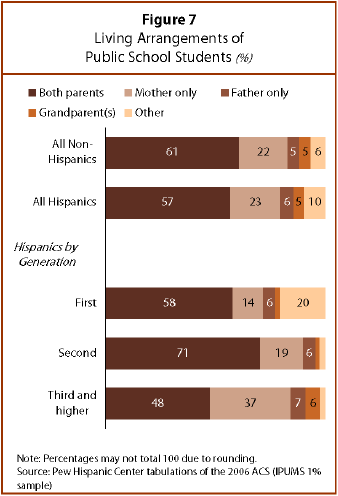 Second-generation Hispanic students (71%), those born in the United States who are the children of immigrants, are more likely to live in a two-parent household than are first generation, immigrant Hispanic students (58%) or third-and-higher generation students (48%). Third-and-higher generation students are most likely to live in a single-parent household, 44% compared with 19% of first-generation and 25% of second-generation students. Immigrant Hispanic students are most likely to live in a household with someone other than a parent or grandparent. One-fifth (20%) of all Hispanic immigrant public school students live with someone other than a parent or grandparent, compared with less than 3% of second-and-higher generation Hispanic students. While more than nine-in-ten second-and-higher generation students live with at least one parent, only 77% of first-generation students do so.